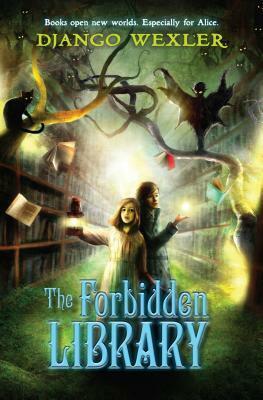 The Forbidden Library by Django Wexler – It's Time to Read! This is the first book by Django Wexley I have read, and it is the first in The Forbidden Library series. In this novel we meet Alice, a girl recently orphaned, who has been sent to live with her mysterious Uncle. But things are not as they seem. She quickly learns that magic is everywhere and her Uncle is some sort of wizard. She is drawn into this world when she follows Ashes, a talking cat, into the library she has been forbidden from. She is on a hunt to find out what has happened to her father, but she is about to enter a whole new world and start leading a life she wouldn’t have believed possible just a few months ago. This book falls into the scope of fantasy for young adults. But it is more than just that. This book has adventure and suspense. There are unanswered questions – mystery follows through the book – and there is fighting and the need to survive throughout the book. As a character, I quite liked Alice. She was hard working, compassionate and fearless. She is however, only 12 and I think that when you read through the book you forget that. She seems to be a very mature 12 year old. I felt like I was reading the adventures of a late teen, not a girl. I did find it convenient and a bit far-fetched the number of times she suddenly had a plan that would save her life. My favourite character was Ashes – who doesn’t love a grumpy cat! He reminded me a lot of Grimalken the cait sith from the Iron Fey series. As a rule, I don’t like cats, however Ashes was exactly how I imagined a cat who could speak would be. He was definitely a highlight in the book for me. I think my biggest complaint with this book is simple: it dragged a bit. I know I have said that there is action and adventure, but it was a bit slow. I did find myself checking to see how long I had left in the book. There is a lot that happens in the book – we are taken into three different worlds, there are the encounters with the evil fairies, plus we watch Alice fight for her life on more than one occasion – yet there were moments when I wondered if I would finish the book. Overall, I am rating this book 3 out of 5. There are elements of this book which I really enjoyed. There is action, a sense of mystery and I did wonder what was going to happen. However, I won’t be rushing to read the next book in this series.